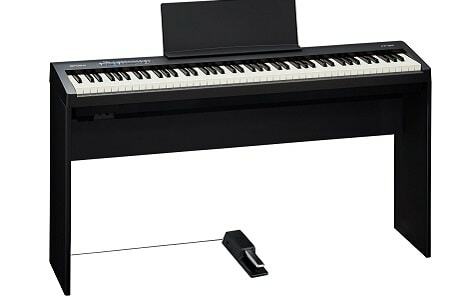 The Roland FP-30 is fast becoming a benchmark for high-quality portable pianos. It ticks all the boxes for a pianist requiring a natural weighted key action, with exceptional sound and a portable lightweight frame. The FP-30 packs a powerful set of stereo speakers to give a detailed and large tonal range. If you get the urge to start playing late at night and don’t want to disturb your family or neighbours, the headphones input employs a 3D ambience effect, so that it can be played silently and have a full sound, as if it is being played with the full sound of the speakers. The FP-30 has a progressively weighted key action with an ivory feel, a premium key-feel compared to pianos in the same class. The combination of this responsive key action, with the vast tonal range of the sound engine, results in a highly expressive piano. For a more traditional setup, the optional stand and three-pedal unit provide an integrated look and classic pedal configuration, while maintaining a much smaller footprint than a typical upright piano. The foot pedals can also be used for hands-free turning of onscreen music pages when using apps such as PiaScore and Sheet Music Direct, all controlled via the inbuilt Bluetooth system. For composition, the FP-30 can connect to a computer either by USB or Bluetooth, making it both a perfect complement to a home studio and an expressive instrument to notate a piece of music.